This past weekend on September 29, 2018 marked the completion of 150 days as the proud owner of N62BS, my 1962 Beech Bonanza. Since acquiring the airplane, I have had the opportunity fly it just a bit over fifty hours. As luck would have it, the weather has been most uncooperative ever since I brought the airplane home resulting in the cancellation of several planned family trips (my wife and daughter are strictly “fair weather” passengers). 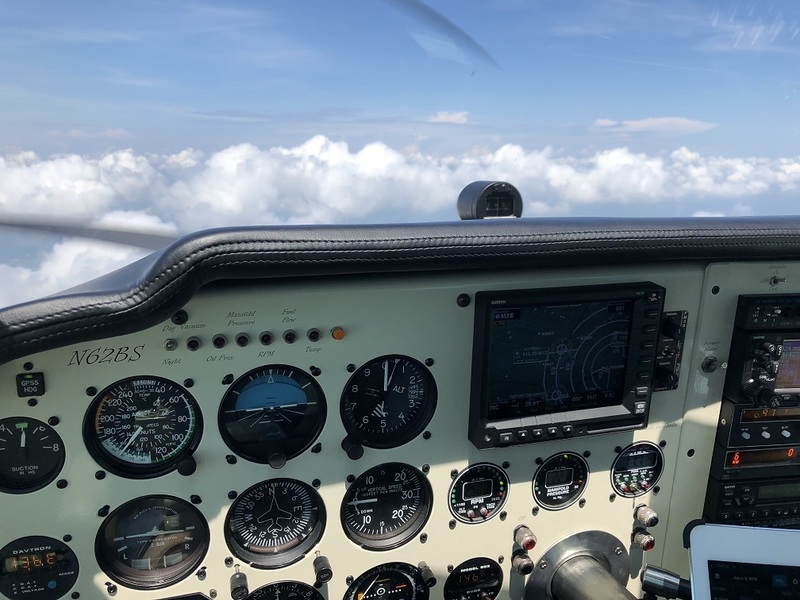 This article details my experiences as a new aircraft owner with emphasis on two areas of general interest to new or prospective airplane owners – the cost of ownership and the benefits of ownership. First, lets start with the cost of ownership. The past five months have been very instructive as to the “real” cost of airplane ownership. Despite purchasing a very well equipped and well maintained aircraft, maintenance is an inevitable part of the ownership experience. Maintenance expenses are also the hardest to forecast, and it is for that reason that the acquisition budget should allocate a significant reserve for maintenance from the first day of ownership. Fortunately, my airplane has had little in the way of maintenance surprises. However, even “routine” maintenance often times cost more than what you expect. Let’s look at some of the maintenance and upgrades that have been done to N62BS since bringing the airplane home in May. Upon getting the airplane to its new home in Allentown, PA from California, I immediately started to address some of the issues that were discovered during the pre-buy inspection. Keep in mind that Ron Sanow was brought in to assist with the pre-buy. Ron is known to many as a Service Clinic Inspector at the ABS Service Clinics and also wrote the ABS Flight Control Rigging Guide. So, as you can imagine, this was a very thorough pre-buy inspection. Yet, most of the issues discovered during the pre-buy were relatively minor and certainly not safety-of-flight issues. One of the biggest issues involved a broken cowl flap control cable. In fact, I flew the airplane all the way from California with the cowl flaps closed. Of course, I carefully monitored the temperatures during climbs. However, I had this fixed immediately upon my return to ABE. The seller of the airplane had agreed to discount the price of the airplane to cover this issue, which we figured would be the most expensive item to fix. At the same time that they replaced the cowl flap cable, I asked my mechanic to look at the fuel valves for the tip tanks. The previous owner of 26 years never put fuel in the tip tanks and the valves had not been used during that time period. They were very hard to turn and I was concerned that they might physically break. My mechanic talked with Osborne and they discussed two options to resolve the problem. Osborne makes a kit to rebuild the valves in-field which is pretty reasonable, but this option involves quite a bit of labor. Or, we could just completely replace the valves with new ones which are quite a bit more expensive than the repair kit, but save quite a bit of labor. I elected to go with all new valves. And, of course, the cost of this repair/replacement eclipsed the cowl flap repair by about a factor of three! Since the airplane was in the shop having the fuel valves replaced, I thought it would be a good time to have GAMI injectors installed as well. This was an upgrade that I had planned on doing if the airplane I purchased did not already have them installed. The GAMI injectors allow me to run the engine lean of peak resulting in a fuel savings of nearly 20%. In fact, I have already nearly broken even on this upgrade with the dollars saved on fuel expenditures. For those not familiar with the GAMI injectors, they are carefully calibrated to much tighter tolerances than the standard Continental injectors. This allows lean of peak operations that often are not possible with the factory injectors. This is due to the wide spread between where the various cylinders’ EGT peaks at. Prior to installing the GAMIs, there was a difference in fuel flow of about 1.8 gph between the point where the richest cylinder and the leanest cylinders peaked. Now, four of the six cylinders are peaking exactly together. Having sent the engine data to GAMI for analysis, they sent out two replacement injectors for the cylinders that are not peaking quite with the others. Those are being installed this week. This was not an inexpensive upgrade, but if you fly a lot, it pays for itself very quickly and results in much cooler cylinder head temperatures which has a long-term added value. When I bought the airplane, I knew that the pitot-static inspection and transponder certification were all due at the end of June. I made arrangements to have my local avionics shop do the inspection the week before I was scheduled to leave on a family trip to Kansas City. You can’t imagine my surprise when the avionics technician calls me up to tell me that my system cannot be certified because my Garmin GTX330 is subject to a mod that had not been complied with (and should have been done seven or eight years ago). The only way to tell whether the mod had been done was by pulling the transponder out of the tray and physically looking at the dataplate. The mod in question requires that the unit be sent back to Garmin (with a 15 day turnaround). Luckily, my avionics tech had a GTX330-ES in stock. I had been contemplating the upgrade of the transponder to the –ES version anyway as part of the ADS-B upgrade, so I ended up trading in my GTX330 on a new GTX330-ES. This was likely the path I was going to take as part of the ADS-B upgrade process (which also involves upgrading the Garmin GNS430 to include WAAS), but I would have preferred to do it on my own schedule. Another issue that I am working through as I write this is in regards to the tip tanks. As mentioned earlier, the previous owner never utilized them. When a system in an airplane is not used for a long period of time, you can be sure that it will become problematic. Going into the purchase decision, I knew the tip tanks had not been utilized for decades. Quite frankly, it did not bother me at the time because I couldn’t imagine needing that much fuel. After all, my wife and daughter can’t handle for than about three hour legs. Even when I am solo, I can’t imagine flying more than four to five hours without needing to stop and stretch my legs. However, since getting the airplane, I find myself nitpicking everything. I want everything to work perfectly, even if I don’t use it. And, quite frankly, with the high cost of fuel at my home base, I am learning that those tip tanks might offer me an economic benefit! So, with the fuel valves now working and some fuel in the tip tanks, I proceeded to drain fuel samples from the sumps located at the bottom of the tip tanks only to discover that the valves were frozen shut from years of no use. Determined to pull fuel samples from those tanks, I tried several times to free up the valves and when I finally got one to start draining fuel, it would not stop draining fuel until the tank was completely empty! Luckily I had some empty 5 gallon gas cans sitting in the hangar. I ended up filling three of them up with 100LL. New drain valves have been ordered from Osborne and they will be replaced soon. In the meantime, no fuel can be put in the tip tanks. Another relatively minor, but important issue is a recent tire issue that I had. I usually check the air pressure in the tires between flights when I am at the hangar just puttering around. A few weeks ago I flew to Pottstown, PA to meet Mike McNamara, the president of the Northeast Bonanza Group. I got out the airplane and he immediately pointed out that my right main tire looked a bit low. 10 pounds low, to be precise. I got back to Allentown and inflated the tire back up to 30psi. A week later, the tire is back down to 20psi. I am still waiting to hear back from the mechanic on this, but I suspect it is a leak in the tube. Most of these issues are not total surprises, but the takeaway is that even the best maintained airplanes are going to have issues. Another consideration is that when you acquire a new airplane, there will always be a certain number of “modifications” or upgrades that the new owner needs or wants to suit their specific situation or flying style. For example, I installed a MyGoFlight Center Collar Yoke Mount for my iPad. This was a very inexpensive upgrade in the grand scheme of things, but absolutely necessary because I despise kneeboards and often have someone sitting in the right seat. In the first 150 days of ownership, I have spent nearly 10% of the purchase price on maintenance issues and upgrades. I suspect that by the end of the first year of ownership, that number will be approaching 20% of the purchase price. The best advice that I can offer to any new airplane owner is to make sure that you do not spend 100% of your budget on the purchase price of the aircraft. Make sure that you have a healthy reserve for maintenance issues that will crop up after you take possession. Despite how thorough a pre-buy inspection might be, there will always be maintenance issues that need to be addressed in those first weeks or months of ownership. In Part Two of this article, I will focus on the benefits and joy of aircraft ownership. Stay tuned!